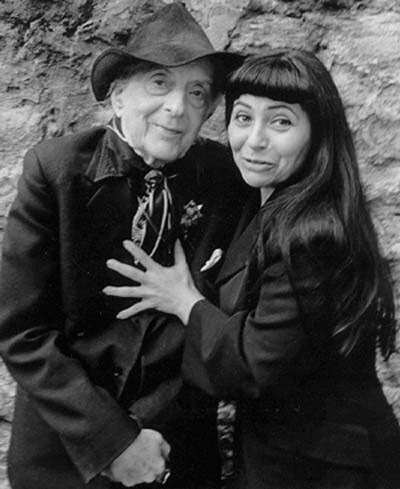 Quentin Crisp maintained his links with the world of life modelling through his friend the artist, performer and model PENNY ARCADE. Here she reminisces about their shared experiences for Bare Facts. Among the many coincidences between Quentin and me (for example, we both changed our names, we both performed because people liked to hear us talk and asked us to, we both said yes to people's requests), the similarity of which we were most fond was that we were both artists' models. In 1992 I was invited to be an artist-in-residence at the Skowhegan School, a very prestigious summer arts colony founded by the late artist Ben Shahn. I didn't bother telling the administrators that in 1977, I had been a model at Skowhegan. I don't know how much people know about the American art world, but in America artists' models are considered to be just below kitchen help. In fact this invitation to be a featured artist at Skowhegan made me one of the very few artists' models in the world, along with Quentin Crisp and Kiki of Monparnasse to be invited anywhere as a visiting artist. Naturally, once I got there a big element of my performance concerned being a model. Quentin loved this story. Quentin and I were photographed together many times. Even more fluid and articulate than our stage conversations were our posing sessions. We shared the special language of models - the non-verbal language of mood an movement. The last time we posed together was for Melody Maker. Even on a crowded street corner we could instantly enter that silent world. One of the stories about modelling that Quentin loved the most was of an incident that occurred in the early '80s and influenced my style of performance, which is called 'direct address'. I was modelling for a foundation class. In the early '80s drawing from the model was considered old hat and the class of 80 or 90 students just talked throughout the entire period. After 45 minutes of my usual challenging poses, I yelled with the full force of my lungs "SHUT UP! You are disturbing my concentration!" This stunned the entire group into silence and ended with the instructor weeping openly as he told me that it wasn't until the moment of my outburst that he realized how defeated he felt day after day as these ignorant creatures babbled. Some weeks later, for a different class, he asked me to talk about modelling to the students as they drew me. I feel very honoured to be asked to contribute to Bare Facts. I know that Quentin would have considered it a great honour, too. We often spoke of the difficult life of the artists' model and of how little understood the job is. He and I often agreed that the model is the only person in the room who knows what is happening between the artist and the easel. Energistically speaking, it is the artists' model who can feel the artistic energy (or lack of it). Lots of love to Bare Facts and all its readers. Penny. The picture of QC and Penny is by Lina Pallotta and comes from Penny's website. If you're going to contact Penny with your memories of Quentin, please share them with us as well!